Mui flower in pink color creates a simple Chinese style. It is a good choice announce your wedding to all your friends and relatives. This card is for you to announce your wedding. Basically, there are friends whom you may not invite to your wedding. To this end, you will send them announcement card to inform them about your wedding. 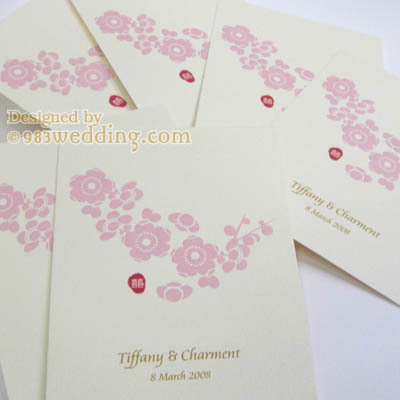 Usually, it will be a good idea to have an announcement card design which matches your main invitation card. 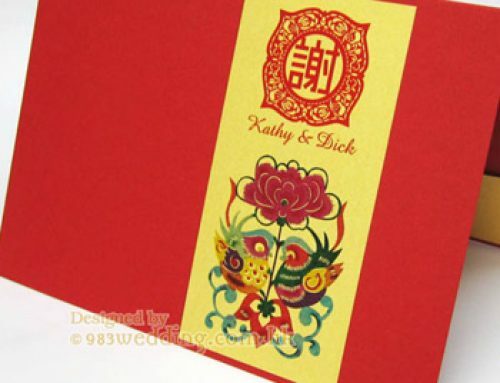 The design of this announcement card carries the original design of Mui Blessing. There are beautiful Mul flowers (Cherry Blossoms) with a double happiness on it. Of course, it is not a must to have it as your invitation. You can use this announcement card no matter what your wedding invitation design is. Usually, an announcement card will be one with a very simple design. You will be using it to announce your wedding. You will not expect your friends who receive them to come to your event. You are just trying to announce the event with this card. It is not an invitation at the end of the day. 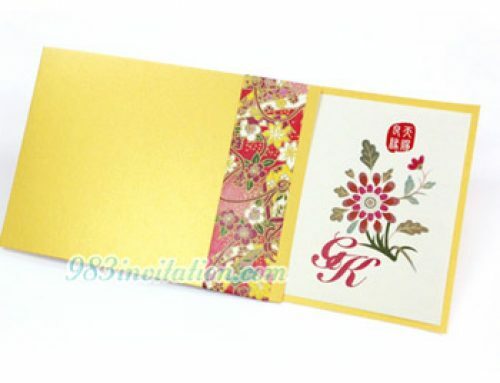 As a result, the treatment of such cards is usually a lot simpler than a wedding invitation. 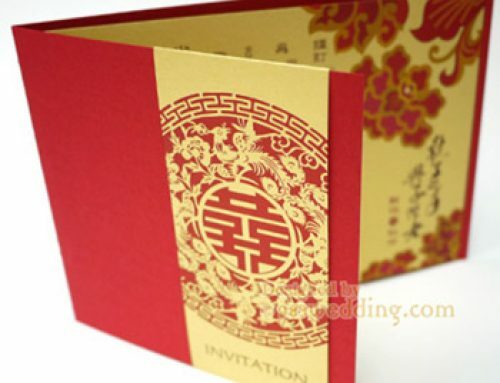 The printing and production method of it is simpler than the original invitation design. 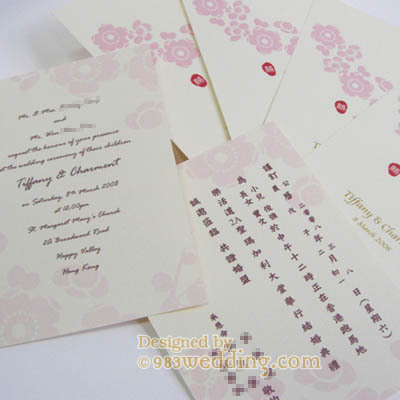 Instead of using embossing like the original invitation design, the cherry blossoms are printed in pink color on the card. On the other hand, the double happiness symbol is printed in red color. This creates a slightly different atmosphere when compared with the original invitation design. 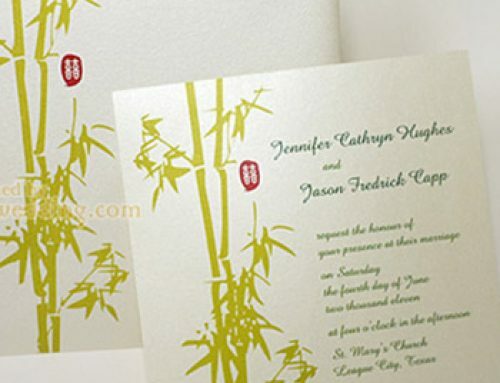 Yet, it delivers a very nice sense of Asian wedding invitations. The above is the treatment of the card front. We make the back of it simple. Essentially the wording is printed on this side. Yet, we do not just print the wording. Cherry blossom is also printed. Yet, it is treated as a watermark and background here, which echoes the design of the card front. Although the main idea of creating this design is to make a wedding announcement card, it can be used as the actual wedding invitation. It is considered a simpler version of the original “Mui Blessing” design. 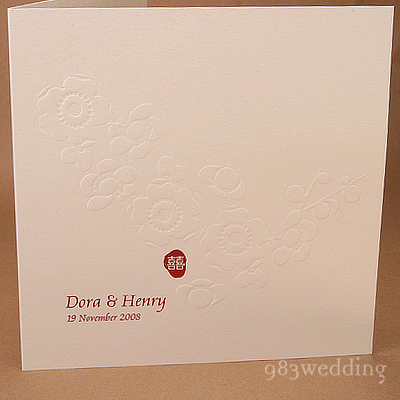 The design is beautiful and elegant enough to be used as the main invitation. The only thing is that only one language of wording can be printed. 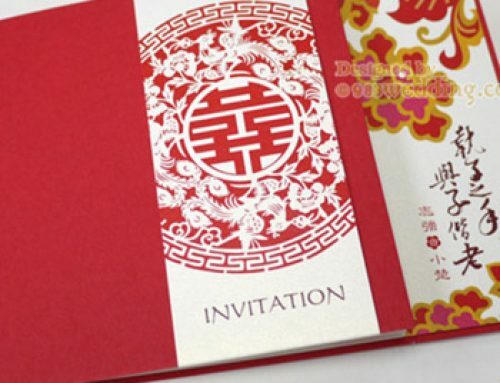 It will not suit your requirements if you need to have a bilingual invitation card. 300gsm TP creamy pearlised paper with full color printing on BOTH sides.